Died from the effects of active service. Tom came from a family of mine workers in Caergwrle. He was born in 1878, and baptised on the 10th November that year at the parish church of St Cynfarch, Hope, Flintshire. Toms parents, Edward Griffiths (a 22 year old collier) and Ellen Evans (the 18 year old daughter of a butcher) were married on 18th March 1878 at the parish church of St Cynfarch, Hope, Flintshire. In 1881 the census recorded Tom, his parents and baby sister Annie Jane were living at Bridge End, Hope (by the River Alyn). On census night in 1901 Tom was not at home, but does not seem to be recorded elsewhere. This may simply have been an omission on the part of the person completing the census form. 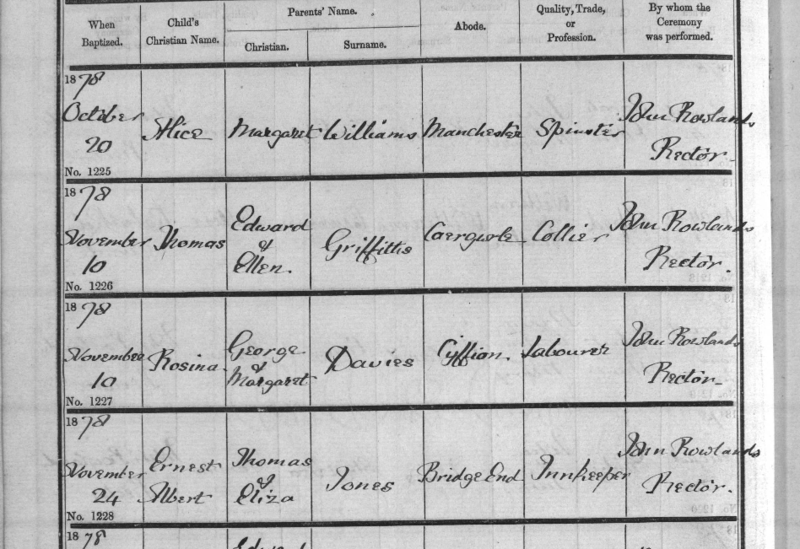 In 1911 the census recorded that Tom was a 33 year old unmarried coal miner living with his mother Ellen, unmarried brother Nathaniel, unmarried sister Agnes, cousin Janet, and Horace Griffiths (4) and Percy Griffiths, (2) at Derby Place in Caergwrle. Horace and Percy were recorded as Ellen’s Grandchildren. 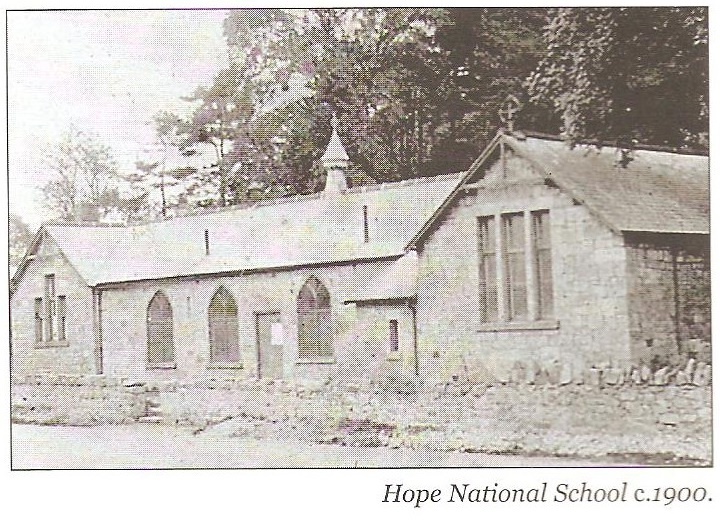 The Admission Register for Hope CP school stated that Ellen was their guardian; there is no record of their parentage. The 1911 census return also stated that Tom’s father Edward (also a coal miner) was living as a boarder with the Gould family in Hope. Both Ellen and Edward stated that they had been married for 33 years. The fact that they were not recorded together does not mean they lived apart! Edward may have had a particular reason, possibly work related, for staying elsewhere that night. Tom’s military records have not been found – presumably they were part of the “burnt records” which were destroyed by German Bombing of the record office in London in WW2. 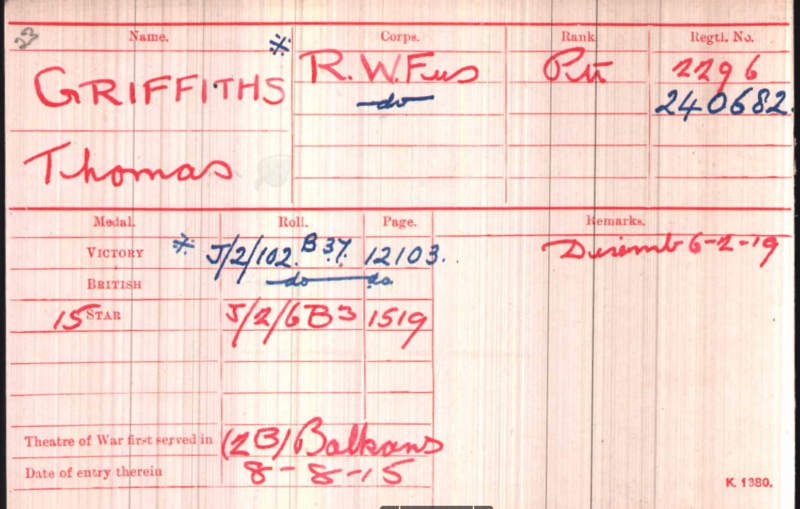 However his record card in Flintshire Record Office states that he served as a private in the 5th/6th Battalions of the RWF, for 4 years and 6 months, serving in the Dardanelles and Egypt. His medal record card records two regimental numbers – 2296 and 240682. It also recorded that he entered the Balkans theatre of war on 8th August 1915 and gave another date (6th February 1919) which was possibly the date of his demobilisation. 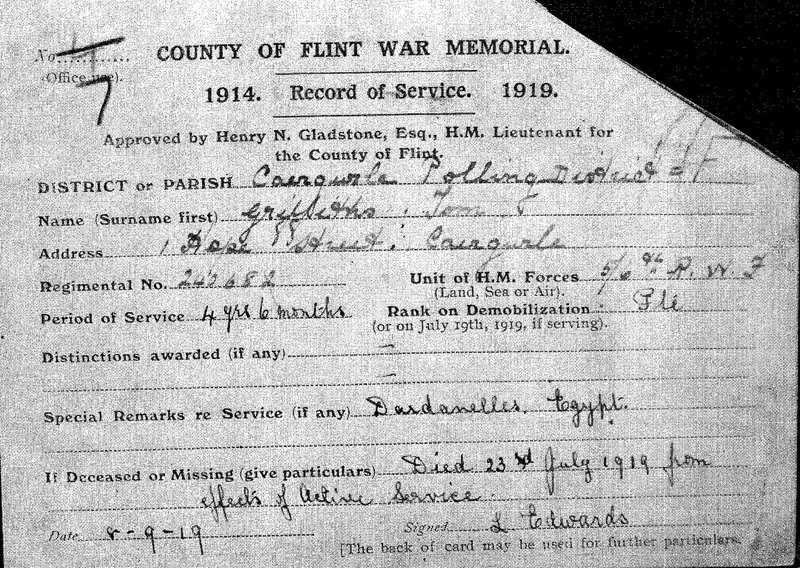 This indicates that he must have enlisted at the start of the war, when he would have been 35 or 36 years of age. 19th July 1915 Embarked for Gallipoli from Devonport, Plymouth via Imbros. 9th August 1915 Landed at Suvla Bay and engaged in various actions against the Turkish Army. Dec 1915 Evacuated from Gallipoli to Egypt due to severe casualties from combat, disease and harsh weather. (The Division was reduced to just 162 officers and 2428 men, about 15% of full strength). 3rd August 1918 Amalgamated with the 1/6th Battalion to form the 5/6th Battalion. Tom died on 23rd July 1919 from “the effects of active service”. The place of death is not recorded but was registered in the Hawarden Registration District. His address was given as 1 Hope Street (his mother’s address), and his funeral was on 28 July 1919 at St Cynfarch’s Parish Church, Hope. He was buried in Hope cemetery, and has a Commonwealth War Grave headstone. Tom’s mother Ellen died aged 62 and was buried on October 11th 1923 in Hope. His father Edward died age 78, at 2 Rock Terrace, Cross Street, Gwersyllt (the home of his son Nathaniel and daughter Agnes) in 1935, and was buried in Hope Cemetery on 24thJune that year. By the time of the 1939 register, compiled just before the start of the second world war, the family still lived at Rock Terrace, Cefn Y Bedd. The household included his brother Nathaniel Griffiths who was described as a “Colliery Banksman Heavy Below”, and his sister Agnes Williams (a widow whose occupation was listed as “unpaid domestic duties”. Tom is also commemorated on the Caergwrle Memorial.